The successor to Goldeneye, Perfect Dark improved every possible aspect of the classic shooter and created an original masterpiece. 4-player multiplayer game modes, with the option of adding 8 extra bots made matches frantic chaos and endless fun. The singleplayer was fantastic at the time, featuring such state-of-the-art features as realtime lighting, blood spatter effects, and fully voice acted cinematic cutscenes. It even let you play the story in local co-op with a mate – player 2 got to be Joanna Dark’s weird-looking blonde sister – the first game I ever encountered with a co-op singleplayer mode. The globe-trotting story bounced all over the place, including off-world to the Skedar’s planet (at which point, I gave up because the Skedar were just too scary). My particular favourite levels were the Carrington Villa, a sunny holiday home where you start off sniping soldiers on a pier far away, in order to save a negotiator. And Chicago, looking like something out of Blade Runner with floating cars and a dirty urban sprawl. That level had an excellent stealth section where you had to crawl into some sewers undetected to plant a bomb on the underside of a limousine. Really cool stuff. Multiplayer was where I spent most of my time, though. Whenever I got 3 mates together, we’d play for hours and hours. We banned the Farsight gun, because it could see through walls for goodness sake. But grenades and rocket launchers were fine, even though their explosions would cause the N64 to chug and sputter if you happened to be playing with 8 simulants (first game I played with bots, too!). The game even had a persistent ranking system, which awarded you with a score and promotion based on how many kills you had. This was years before the likes of Call of Duty and Battlefield’s unlock systems, and I admit to being a little smug whenever my ranking appeared on the screen, as it was always slightly higher than any of my friends… it was my game, after all. They rereleased Perfect Dark on the 360 Live Arcade, and I never realised how terrible some of the voice acting is. Back in the N64 days, simply having a fully voice-acted story with cutscenes was a fairly new thing, and hugely impressive, so I think the quality of said acting didn’t really matter much to me. Still, I don’t need a pair of rose-tinted goggles to remember how much I love Perfect Dark. I was absolutely blown away by that game. 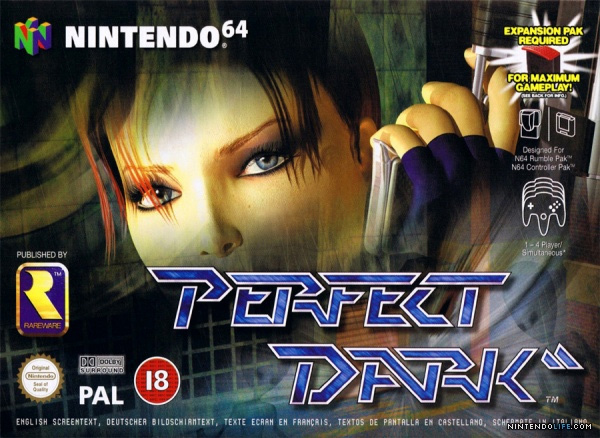 This entry was posted in Features and tagged gaming memories, perfect dark. Bookmark the permalink.